Get personalized recommendations and discover new books based on your tastes. Goodreads Choice Awards: vote for your favorite books of the year and see the winners! Participate in the Reading Challenge! See book reviews and updates from your friends. Discover new books and explore popular book lists. Rate and review any book in our catalog of more than 12 million books. Share notes and progress updates as you read. 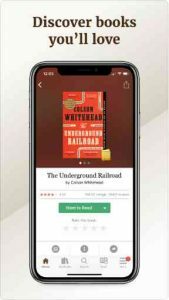 Join online book clubs and connect with other readers. View literary events near you.